Trafalgar Place, the first completed phase of the Heygate estate redevelopment has been nominated for the Royal Institute of British Architect’s (RIBA) Stirling Prize. It follows the nomination last year of Neo Bankside, another development in north Southwark that failed to provide promised affordable housing. It’ll be gratifying to ex-Heygate residents that a private development founded on the rubble of their homes is in line for such a prestigious prize, but we would have thought RIBA would be looking for something with a bit more élan. Trafalgar Place’s most distinctive characteristic is that it is built on the footprint of 104 demolished council homes, while itself providing only eight social rented homes out of its total 235 units. Over 60% of its units, combined with those of developer Lendlease’s One the Elephant, were pre-sold off-plan, most likely overseas, before it was even built. What therefore has prompted the nomination of what looks pretty much like every other new development in London? It cannot be an acknowledgement of its environmental credentials – it has 47 car-parking spaces in what was intended to be a car-free development. 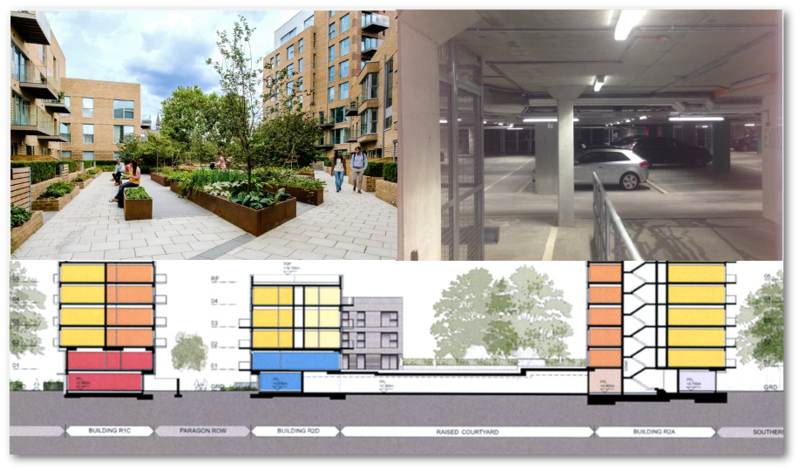 Developer Lendlease persuaded Southwark Council that the viability of the whole Heygate redevelopment depended on having 663 car-parking spaces, of which the 47 are a small part, despite the Elephant being a car-free development zone, with the highest rating for accessibility to public transport(PTAL 6). Trafalgar Place’s car parking lot also serves to elevate its courtyard above and beyond any public access. Trafalgar Place should also have showcased the much lamented MUSCo (Multi Utility Services Company), whose cutting edge delivery of utilities and use of on-site renewable energy were lauded by Bill Clinton and hailed as an example of ‘climate positive development’. The MUSCo, alas, fell victim to hard negotiations on the Regeneration Agreement in 2010 and we have instead an ‘Energy Centre’, which is essentially a gas-fired boiler. 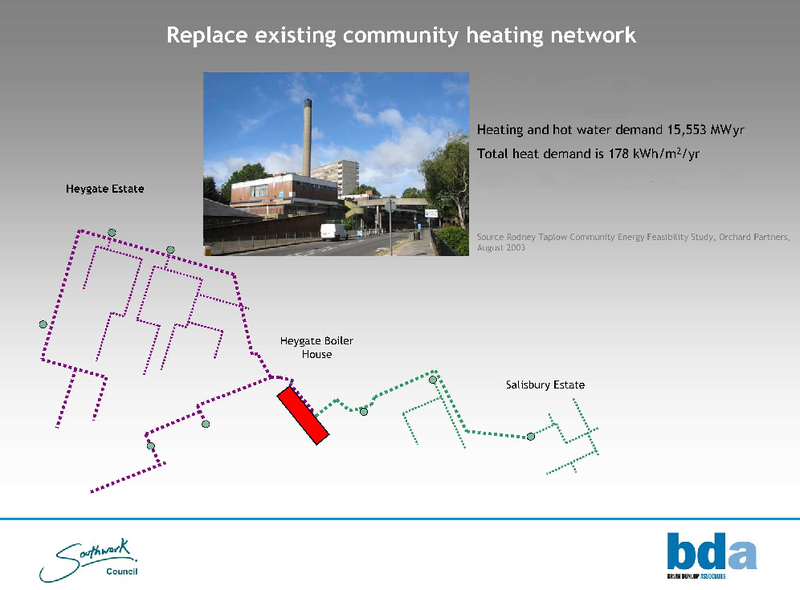 The previous gas-fired boiler on the Heygate, supplied heat and hot water through a district heating network to over 2,000 homes on both the Heygate and the neighbouring Salisbury estate. Lendlease’s district heating network will not extend beyond the Heygate footprint - it will not supply the Salisbury estate, and will not be supplying telecoms, potable water, non-potable water, drainage, gas, fibre-optics and vacuum waste as the original MUSCo had planned to. Proposals to supply other estates and developments have been dropped, and all methods of supplying heat and water that rely on renewable sources of energy were rejected on grounds of their cost impact on viability. Lendlease acknowledged that its energy strategy did not comply with Southwark’s 20% on-site minimum renewable energy requirement in its planning application’s Energy Statement. As mitigation it promised a few symbolic solar panels totalling around 3% on-site renewable energy and to try to source some of its gas requirements from renewable gas sources, such as biogas plants. However, the problem is that there are very few such plants fully operational in the UK and many questions remain unanswered as to the green credentials of biogas. 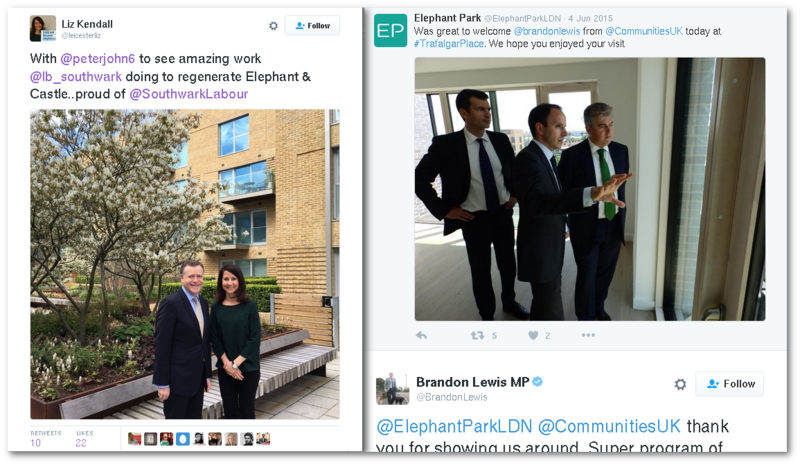 Nevertheless, Lendlease maintains that it is building a ‘zero carbon growth’ development (subtly different to ‘zero carbon homes’), a claim based on an unpublished study, which, we’re told, shows that ‘Elephant Park’ will produce less operative carbon emissions than the estimated operative carbon emissions of the Heygate estate it is replacing; i.e. the new gas boiler will be more efficient than the old one and the new homes will be more energy efficient than the old ones. So, Trafalgar Place is not much to look at, lost us council housing and only maintains an exemplary environmental reputation through smoke and mirrors – why has it been nominated for the Stirling Prize? It is a choice that has evidently caused some anxious debate within architectural circles, provoked by our good friends ASH and involving RIBA’s president-elect Ben Derbyshire. Mr Derbyshire warns his colleagues against the ‘mistake of attempting to stretch beyond their political legitimacy and reach’ and that RIBA ’is neither the House of Commons nor the United Nations’. We take this to mean that considerations such as the demolition of council estates and the forced removal and displacement of estate residents should play no part in the award’s deliberations. This is hopelessly naïve, to put it kindly. 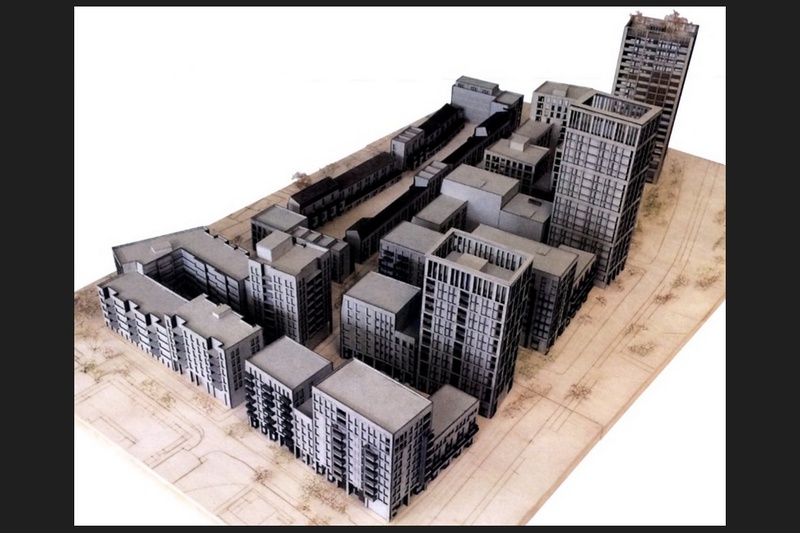 The Stirling nomination of Trafalgar Places casts estate regenerations generally in a good light and it invests the Heygate redevelopment in particular with prestige, a prestige that will no doubt translate into higher sales prices, should it actually win the prize. As well as being RIBA’s president-elect Mr Derbyshire is chair of HTA Design LLP, which was selected by Southwark and development partner Notting Hill Housing to draw up the plans for the Aylesbury estate regeneration. The Aylesbury estate regeneration is now stalled, while Southwark and Notting Hill Housing digest the government’s refusal to grant it a compulsory purchase order for the homes of elderly leaseholders from black and ethnic minority backgrounds, one reason for the decision being that Southwark failed to fulfil its public sector equalities duty towards them. Another reason given for refusal was that ‘the deficiencies of the scheme include the number of dwellings that fail to meet the Council’s adopted standards for sunlight and daylight, and the extent of overshadowing to the proposed amenity areas’. HTA Design LLP can’t be held fully responsible for Southwark’s failure of course, but Mr Derbyshire has very properly noted that the built environment professions have a duty ‘not to infringe human rights in the way we design and deliver services’, so it might nonetheless be a case for RIBA to consider when the drafting any national code of conduct and ethics under Mr Derbyshire’s leadership.